It's not even half of January yet, but I've learned so many valuable lessons... in a not flattering way. Maybe when I said one of my New Year's Resolution was to learn something new everyday, He took it as a challenge. Life has always had its way of teaching us lessons. In the end, it's up to us whether we choose to learn from them, swallow our ego, and change for the better; or... We can be stuck up, ignorant and worse, blame other people for our unhappiness. It is always easier to make excuses than to admit your own mistakes and deal with the consequences, right? But as they say, "When people blame others for their mistakes, they learn less and perform worse." I agreed. You may succeed in making another feel guilty about something by blaming him or her, but you won't succeed in changing whatever it is about you that is making you unhappy. LOVE EVERYTHING about this outfit! especially the leo print! You look great! I like everything - from head to toe. Plus pictures are great, it's like background is corresponding to what you're wearing. Elle...i've seen this outfit in your instagram ages ago..Am i right? anyway, i'm agree that everyday we learn something new, and not muany people wisely choose to reflect back and try to overcome their weakness..Hope i can be one of them though..:D haha..
love ur maroon sweater ci elle..
cute sweater ci <3 anyway i agree with you, we shouldnt blame others for our unhappiness, but we have to look into ourselves deeper, because everything happens for a reason and that reason comes from ourself. i love this look, especially the yellow beanie! I want a beanie like that, everybody has one and seems to be so cute!!!!! You are so much beautiful and so much cutie on the photos.. Really nice to see. So kawaii <333 ,another Japan post again maybe? love everything you wear here! 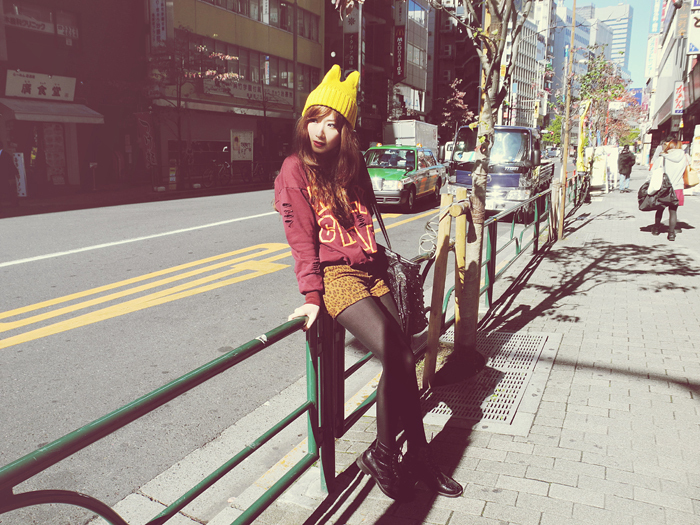 i adore the sweater & yellow hat so much! All for the best! :) Yay!